Have you been injured in a bicycle or a pedestrian accident? We can help. Our Santa Cruz personal injury law firm is experienced and successful in handling cases involving bicyclist and pedestrian injuries. $2.8 million settlement for a woman injured by a newspaper delivery person when struck while crossing a street in a crosswalk. See more bicycle and pedestrian success stories. The legal team at Scruggs, Spini & Fulton has successfully resolved thousands of personal injury and wrongful death claims involving automobile, big truck, motorcycle, bicycle and pedestrian accidents, obtaining millions of dollars in compensation for our clients. We are Santa Cruz County’s largest and most experienced personal injury law firm and will work with you to insure that you are fully and fairly compensated for your loss, including medical care, lost wages, and pain and suffering. When a motorist violates the rules of the road and puts the rest of us at unnecessary risk, among those most vulnerable to catastrophic injury and wrongful death are bicyclists and pedestrians. Whether one is in a bike lane or a crosswalk, the California Vehicle Code entitles such a person to legal protection, and the violation of established safety rules can result in severe consequences. The driver’s claim is usually that they did not see the cyclist or pedestrian. The Bay Area and the central coast are primarily urban areas, and motorists are required to be on the lookout for pedestrians. Most motor vehicle versus pedestrian cases involve claims by the motorist that he or she simply could not see the pedestrian in time, even when a pedestrian is in a crosswalk or otherwise has the right-of-way. In cases where pedestrians have been seriously injured or killed by a motor vehicle, issues of the opportunity to see a pedestrian and then to appropriately react and avoid them is often the subject of expert witness testimony in the form of accident reconstructionists and human factors analysis. In these cases, prompt and early investigation to obtain all possible physical evidence and the identities of any possible witness are paramount. Cases involving bicyclists also routinely involve claims by the operator of the motor vehicle that they did not see the bicyclist in time. Visual perception of bike riders, even in bike lanes, is an important human factors element which must be persuasively explained to an insurance company, judge, or a jury by expert witnesses in order to prevail. Because of the almost complete lack of protection which a pedestrian and bicyclist have in any crash with a motor vehicle, the injuries are often significant, including brain injuries, back injuries, and even spinal cord injuries. 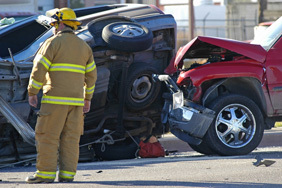 Because of the significance of these types of cases, they often involve claims not only against the motorist who caused the accident, but against the property owner or governmental entity who may have created a dangerous condition at the location of the collision which significantly contributed to it. SS&F have successfully tried many pedestrian and bicycle injury cases. The Santa Cruz attorneys at SS&F have a long history of representing bicyclists, pedestrians and their families in cases like these. SS&F has obtained millions of dollars in recoveries because of its aggressive approach to obtaining all available collision scene evidence, identifying crucial witnesses, hiring the appropriate experts, and holding those who are responsible for creating unnecessary danger to our clients accountable. One important aspect of holding those at fault responsible for the injuries they cause is that the streets and highways are made safer for our friends, for our families and community in the future.